At around 3am, Malik was put in a police mobile along with Siddique-ul-Farooque, [PML Leader], who was being sent to Bahawalpur Jail — via Attock! Farooq had to endure the bumpy four-hour long ride to Attock, plus many more hours to Bahawalpur in the south. It was bitterly cold. The prisoners did not have adequate clothing. They arrived at Attock at 6.30 am, where plainclothesmen took Malik through a side gate, and into a room. Uniformed policemen searched Malik so thoroughly “that if they had been looking for a needle in a haystack they would have found it.” He was glad he had removed his money from his socks and handed it in (it was deposited into his account). He was finger printed and photographed like a criminal. Plainclothesmen then took him to the old part of the jail to an area marked ‘Maut-yafta qaidiyon ke liye’ – for prisoners condemned to death. “There was no one else there. They opened a cell and pushed me in.” The cell was bare, with a high ceiling and a concrete slab for a bed. Malik was provided a rough blanket, a rug and a pillow. Each cells could accommodate one person (“and even that was suffocating”) but contained three to four prisoners each. They were sent elsewhere when Malik was brought in. Apparently the barrack was needed for lawyers and those resisting the emergency. “He was among the 41 who were injured during a torch-lit procession during the lawyers’ movement to restore the chief justice. The police threw acid at them. His face was still disfigured. The Sahiwal bar has given the greatest sacrifices. The police filed an anti-terrorism case against them. The lawyers filed a direct complaint against police brutality. The Chief Justice of the Lahore High Court froze their file to protect the police,” alleges Malik. The first four cells of the barracks were apparently reserved for Nawaz Sharif: carpeted, air-conditioned bedroom with mattress, kitchen with fridge, study with table, and a bathroom. 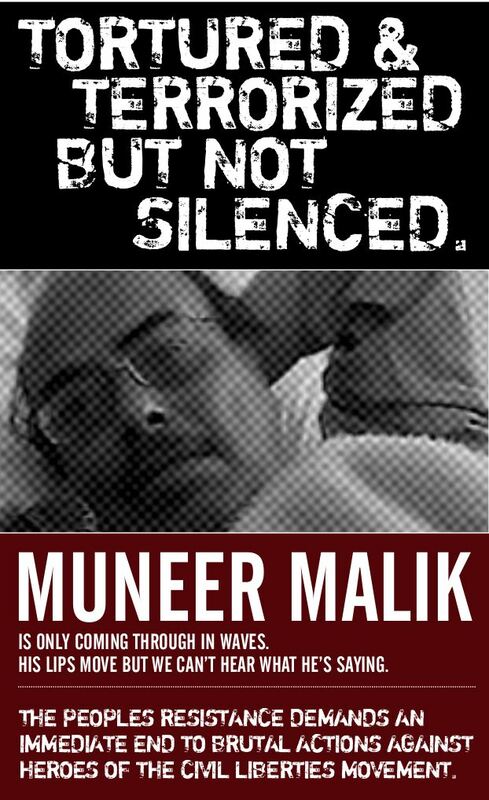 The bedroom was the only place with an electric socket where an ECG machine could be plugged in when a doctor from Attock General Hospital came to check the prisoners after newspapers reported that Malik was unwell. “He checked all the prisoners, we got to lie on the mattress for 30 minutes.” They were allowed in the open courtyard from 7.30am till 4pm, but it was difficult to pass the time after being locked in for the night. The cell was cold and uncomfortable. Malik would fall asleep around 10pm. The light bulb hanging from the ceiling stayed on 24 hours. By Friday, Nov 9, Malik started getting ill. The jail doctor catered to 1,400 prisoners (the facility has a capacity of 340). The medicines prescribed were often not available in Attock, and someone had to go to Rawalpindi to purchase them. Malik’s medication was frequently changed. It did not work, and he had to take sleeping pills at night. “When I had visitors, I had to say I was fine. It was for them to judge from my body language. There was always someone from ISI standing behind me and I feared repercussions. By the next Friday (Nov 16) I could feel the fluid shifting from one side to the other in my stomach. Specialists from outside hospitals came to see me. They all said I should be transferred to hospital, but no one did anything.” One specialist extracted water from Malik’s stomach with a syringe. Contrary to the impression of his family and friends, he was never transferred to the jail hospital. “By the third Friday (Nov 23) I was completely incoherent, unable to even get up.” He doesn’t remember much of the next couple of days, after being finally taken to Pakistan Institute of Medical Sciences, Islamabad. By then, he was near death. Doctors say it is a miracle he survived. He has undergone dialysis four times since then. He was transferred from PIMS to the Sindh Institute of Urology & Transplant in Karachi, on Nov 29. Many imprisoned lawyers around the country were released after they signed undertakings promising not to take part in politics. However, Malik received no such offer. In any case, he says that he “would have died rather than sign such an undertaking”. Musharraf is the most brutal dictator known to the world since Hitler. I hope MQM ditches him and Altaf. This is brutality at its worst! I don’t have words to express my feelings. I am feeling a deep silent rage towards Pakistan army which has [email protected] the motherland. Musharraf treated this army as his personal army and destroyed every institution in the county. Napak army is a a cancer afflicting Pakistan. As Muslim it is indeed a beautiful sight to behold, as every year millions travel to the Sacred City with the same pure intention. When this verse was revealed Muslims numbered a few and were confined to the Arabian Peninsula. Yet even at that time Allah (Subhanahu wa ta’ala) revealed that the Muslims would be spread out through this vast creation, as is so evident today, when one considers that Muslims are found throughout the world. So today it can be seen that camels really would become lean from the journey. The spirit of the Hajj is really conjured up in this thought; millions of people using all means of transport to pursue a quest, and journey in the true sense of the word, all in the direction of the Sacred House. This same direction that every individual faces at least five time a day in submission to the Creator, Allah (Subhanahu wa ta’ala). The magnetism of Allah’s house attracts Muslims in prayer, in thoughts and emotions, and the greatest journey that any Muslim will make. Muslims in the past would spend months travelling for Hajj by foot, by camel, and by boat. Today evidence of this is found throughout Islamic Lands. For example, there are many small communities between what is now Sudan and Nigeria where Xhossa (the language of Northern Nigeria) is spoken. The Xhossa speaking Muslim made a string of communities on the Hajj trail. The potent atmosphere of an old West African village, when it was announced that a family has to set out on the Hajj trial, can only be imagined today. The immensity and importance of Hajj would be put into all of the members of the village. Hajj was always a central part of the communal life of Muslims. There was a time when a Muslim could get on a donkey in Timbuktu and end up in Makkah some months later, with no obstacles but Allah’s created elements and the harshness of the journey. This was at a time when the affairs of Muslims were governed by an authority which drew its guidance from the same source as that of Hajj, the Islamic ‘Aqeedah. Hence there was a harmony between the State and the duty of Hajj. However, since the Khilafah was destroyed in 1924, till today, the rulers in Islamic Lands seek guidance from other than Islam. They turn to man-made law such as democracy, monarchy or dictatorship. Such a harmony as was experienced by previous generations cannot exist in such a situation. The unity of Hajj is destroyed by the present rulers’ division of Islamic Lands. So Muslims are forced to contend with border checks, quotas for numbers of Hajjis based on nationality, customs and the polite and pleasant officers at Saudi passport control. Centuries of expert schools have discussed in depth the requirement and prerequisites for Hajj. Books of fiqh elaborate who is obliged to perform Hajj, what can and can’t be done in ihram, where to put on ihram, the question of ‘umrah before or after Hajj etc. But nowhere in these books of Islamic law is there mention of visas obtained from the Saudi Embassy or the requirement to travel only on certain national airlines. Nor is there mention of the need to carry an EC passport at all times to avoid being arrested or the electronic fingerprint or eyeball records now being taken of Hajjis. Indeed, nowhere within the Book of Allah or the authentic books of hadith will such things be mentioned. The Islamic Lands today are governed by non-Islam, which has complicated the lives of Muslims in too many aspects. Hajj is one of those. It is so apparent that the present governments act as an obstacle to the worship of Allah. However, Makkah is still the direction of the Muslims in Prayer. On this Muslims are still unified. Makkah is still the destination for one of the main events of the lives of all Muslims. On this Muslims are still unified. Muslims standing at different points of longitude and latitude, are all unified praying in one direction. It is as if Muslims are praying in one massive Jama’ah. The pull of the Sacred City gives this Ummah invigoration at the time of Hajj. Muslims must try to harness this vigour and direct it towards the obstacles that lay in front of them as an Ummah. May Allah accept the efforts of all of the Hajjis this year, and bring the true meaning of Hajj into all hearts. May Allah give dignity and strength to this Ummah through those things that it remains unified upon. May Allah help the Ummah to destroy the barriers that remain between Muslims: physically, politically and spiritually.